This guide to RV toilets was brought to you by our friends at Midland radio. RV campers can use their handheld two-way radios when backing into a tight spot at a campground or venturing off to find the nearest port-a-potty. If there was ever a divisive subject among RV campers, it’s RV toilets. For some, they’re an unnecessary and potentially smelly amenity; for others, a non-negotiable feature of life on the road. Whether you love them or leave them, they’re a consideration for everyone who camps, travels, or lives in an RV. It’s a question that can’t be ignored: is an RV toilet right for you? First, do you really need an RV Toilet? Your physical abilities and camping style will dictate whether you need or want an RV toilet in your rig. If climbing out of your camper for a middle-of-the-night pee is off the table, then an RV toilet is probably a good move. For families, having a toilet just steps away can be a lifesaver for tiny bladders. RV toilets offer convenience and an added level of comfort. When you’ve got one in your camper, it eliminates some logistical challenges. You’re more self-contained and won’t need to rely on finding toilets or using wag bags in the wilderness. An RV toilet is ideal for older travelers who are less inclined to squat in the woods and kids who might have trouble holding it on that desolate stretch of highway. Anyone can enjoy the convenience of having everything you need within your shelter on wheels. If you want to feel at home on the road, your home might have a toilet. On the flip side, RV toilets take up valuable space and require additional maintenance—not to mention that you’ll have to empty the dreaded black water tank at some point. If you’d rather keep it simple and aren’t averse to an open-air squat from time to time, then maybe you’ll choose to bypass the RV toilet. RV toilets also present an additional expense. If you’re regularly paying for a spot at established campgrounds that feature their own bathrooms, it might be more cost effective to rely on those amenities, rather than carrying one with you. Regardless of your camping style and feelings about black water tanks (aka a holding tank for toilet waste) it helps to know your options. 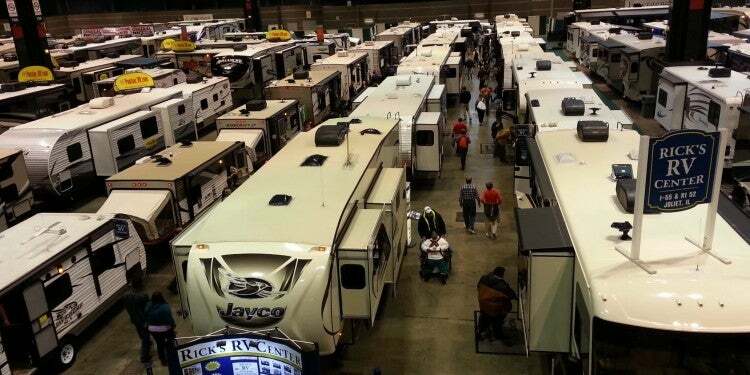 There are many different types of RVs out there and many different types of RV toilets to match. When picking out a toilet, think about throne height, available space, cost, required maintenance, where you’re likely to camp, and your physical needs. If your toilet has a black water tank, consider the cost and availability of dumping locations. Some campgrounds charge a dump point fee while others don’t, but they aren’t available everywhere so you’ll need to plan ahead. So what’s the best toilet for you? 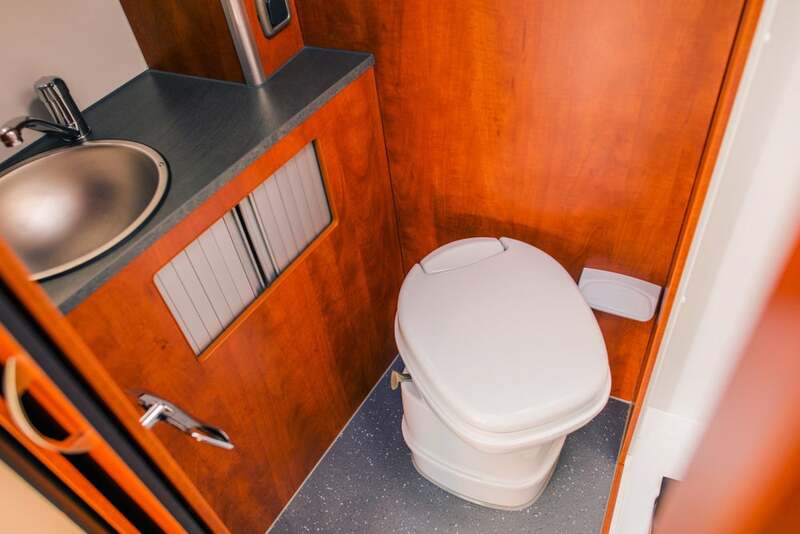 These are the four common types of RV toilets, each with their own pros and cons. Traditional RV toilets are very similar to the porcelain or plastic ones you’d find in a traditional home. They’re installed above a holding tank, however, rather than over a septic or sewer connection. 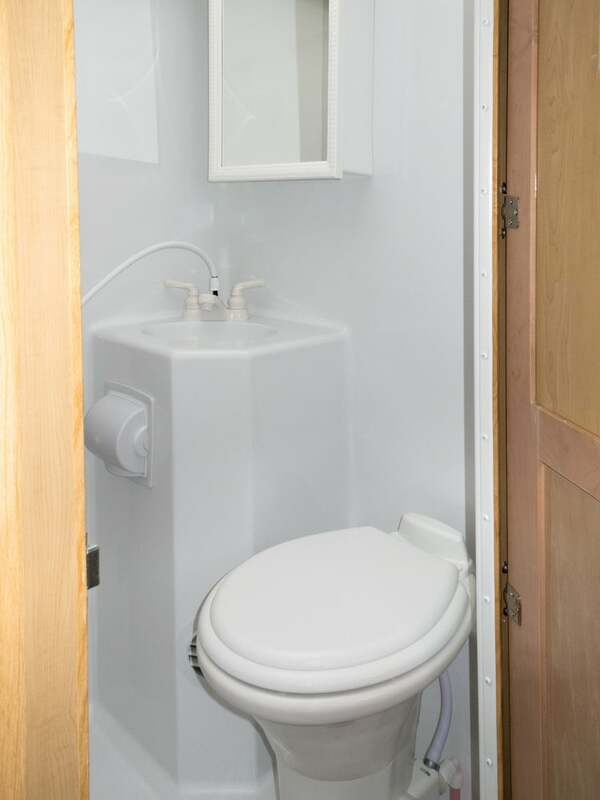 Like a regular toilet, traditional RV toilets require water to function, either by connecting to an external water supply or your RV’s water tank. When you flush—usually by a foot pump or an electric flush—the contents of the bowl go into the sealed-off black water tank. 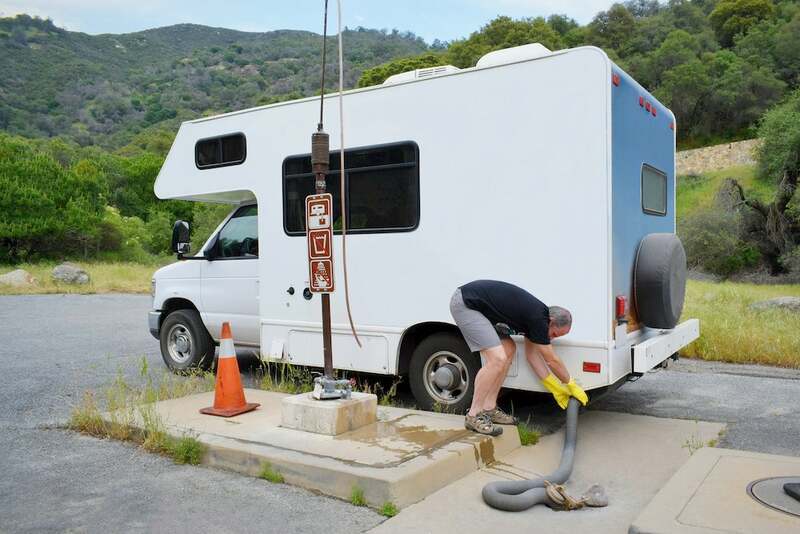 The tank is plumbed to the side of the RV and connects to a hose, which is used to drain the tank into a dump point. This is basically a portable toilet which is fixed in place with a black water tank (or “cassette”) that can be removed through an access panel in the side of the RV. Because of the access panel, cassette toilets usually come pre-installed. The tanks are smaller in size, holding roughly 4.5 to 5 gallons, which means they need to be emptied more frequently. However, you can sometimes travel with an additional tank to increase capacity. If you’ve got limited space and would like to avoid plumbing, a portable toilet might be for you. These are the easiest to install since they don’t have to be fixed to any one spot, though you will need to secure it in some way. This is usually the cheapest option in the RV toilet world. The toilet has a detachable holding tank, which can be emptied in a normal toilet or dump station. Just don’t forget to wear gloves in case of a spill! This Earth-friendly option is great for decreasing your camping footprint, but a composting toilet can take some getting used to. They use no water, making them handy for cold weather and boondocking. The trade-off, however, can be an issue with smell. Some will seal well enough to avoid any wafting odors. A ventilation fan is another option. Unlike the other three toilet types, composting toilets don’t have a black water tank. The holding tank will need a sprinkling of composting material like coconut fiber coir or peat moss, which can be purchased online or at hardware stores. Pros: Easy to install, no plumbing, water, or chemicals required, environmentally friendly, can go 3 to 4 weeks before emptying the solids tank. 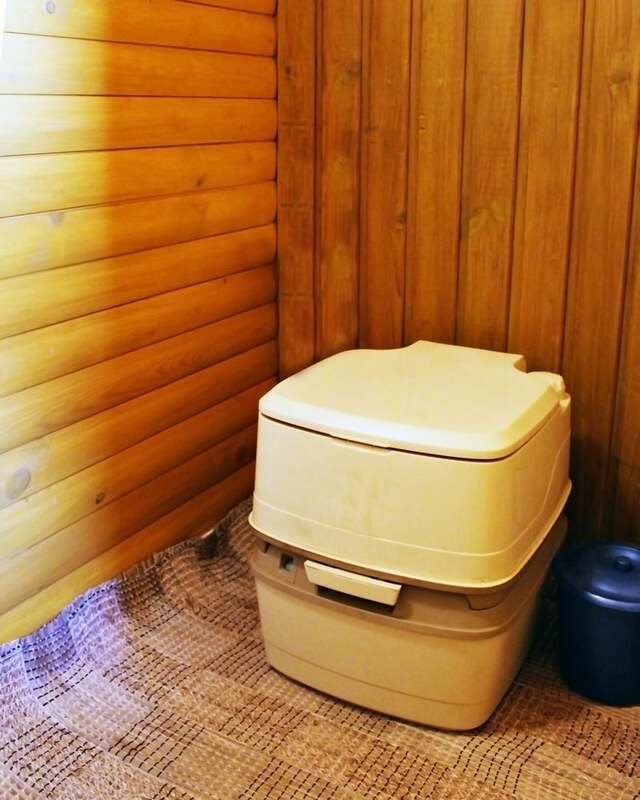 Want to avoid bad smells in your RV toilet? Of course you do. Toilet maintenance is a big part of containing those smells to the holding tank, where they’ll (hopefully) never reach your nose. After you’ve emptied your tank, it’s imperative that you clean it out. This is usually done by pouring the recommended cleaning products down the toilet bowl, then emptying it at the next dump point. “After you dump but before you move, put 1 cup of Borax, 1 cup of blue Dawn detergent and a 10-pound bag of ice [down the toilet]. Then when you arrive at the new campsite, dump. The trip will clean the black water tank, the ice will scrub, and the soap will clean.” – The Dyrt camper Rick Maynard. The seal at the bottom of the bowl keeps odors contained, and if it doesn’t work properly you’ll know it. Prevent a leaky seal by keeping it clean; you can also use plumber’s grease to keep the seal from drying out. Only use chemicals approved for use in your RV toilet. These chemicals help keep your tank clean and break down the waste inside. While you don’t have to use RV-specific toilet paper (though you can), you do need to pay attention to what’s going down the chute. Paper and other items that don’t break down, like wipes, feminine hygiene products, contraceptives, etc., can lead to a clogged toilet. Your tank sensor should give you an accurate reading of how full the tank is; in general it’s a good idea to empty the tank when it’s about ⅔ to ¾ full. Any earlier and the chemicals won’t have a chance to break down the waste properly. A well-maintained toilet can give you the convenience you’re looking for, without the additional headaches of bad smells and overflows. If this sounds like a reasonable trade-off, you might be part of the pro-toilet camp. If it’s all too much and you’d rather go without, just remember to leave no trace. A toilet is a great convenience, but there’s more than one way to responsibly poop outside. This article was brought to you by our friends at Midland Radio. 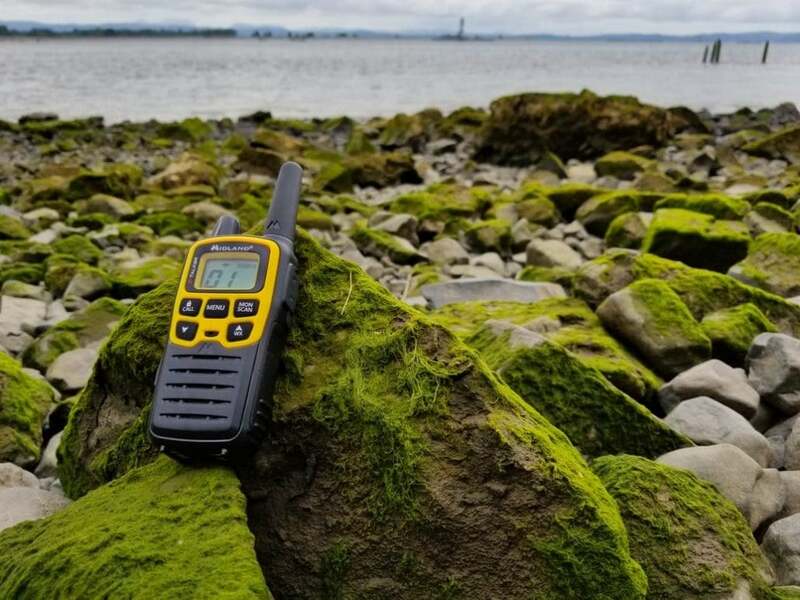 Image from The Dyrt camper Kayla H.
Their two way radios are great communication tool for the campsite and beyond.